Approximately one-third of all college students transfer between institutions at least once according the National Student Clearinghouse Research Center. In tough economic times, many students start at a community college and plan to transfer to complete their four-year degree. 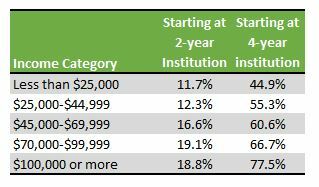 Others start may start at more expensive four-year institutions and find that they need to transfer to less expensive institutions. However, transferring can be a risky business. There is the obvious concern of whether or not all your course work with transfer and be counted towards completion of your degree. Yes, courses can transfer and then only count as electives. More worrisome is that fact that transfer students generally receive less financial aid than those who start at four-year institutions. Furthermore, according to the Texas Guaranteed Student Loan Corporation, they are more likely to receive loans and less likely to receive grants than those who don’t transfer in. Also, according the Digest of Education Statistics, transfer students have lower graduation rates than those who begin at the four-year institution. Given this information, it’s not surprising that colleges and universities with higher transfer-in rates tend to have lower graduation rates. This can be seen among the 50-50 schools. Among the 41 50-50 colleges that 10% or more transfer students, the graduate rates ranged from 49% to 71%. The 19 schools that had one percent or less transfer students had graduates rates from a low of 57% to 86%. Furthermore, public schools make up over 60% of the group of colleges with the highest percentage of transfer students. Only one public institution is in the list of colleges with the lowest percentage of transfer students. This isn’t surprising since students are more likely to transfer to public institutions to begin with. Combine this with the fact that they are less likely to receive financial aid, it makes sense that less expensive public schools would have higher percentages of transfer students. The fact remains that transferring is a reality for many students. One way to identify possible colleges for transfer students is to know which schools have relatively high percentages of transfer-in students and still maintain their 50-50 status. It’s likely that transfer students to these institutions will find more resources targeted to improve the success rate of such students. The following table shows the 50-50 colleges for transfer students based on the highest percentage of transfer-in students. The four-year graduation rate is used for private colleges and the five-year rate is used for public institutions.